Bistro is a WordPress restaurant theme created by Net Labs and featured on ThemeForest. If you need the perfect bistro theme for WordPress, this might be the one you are looking for. The theme setup is extremely easy, you will be able to do it all by yourself without the need of a coding expert to help you out. It has a professionally designed layout that was specially created to attract many new visitors and leave them impressed by the quality and style of your website. The theme looks clean, airy and stylish with a set of numerous options that will help you out in creating the ultimate website you always wanted and needed for your restaurant. Bistro has several special options included, that can’t be found in many other restaurant themes. One of them is the unique Events Calendar where you can manage your past and upcoming events with ease using the custom settings screen. It also features the special Bookings App that is loved and appreciated by countless buyers. Once you try it out, you won’t even know how you lived without it previously. Your customers will be able to book and make reservations very easy and within just few minutes. The theme features many specials, promotions and event managers that are meant to market your business in the best possible way and open your restaurant’s doors to numerous new happy customers. 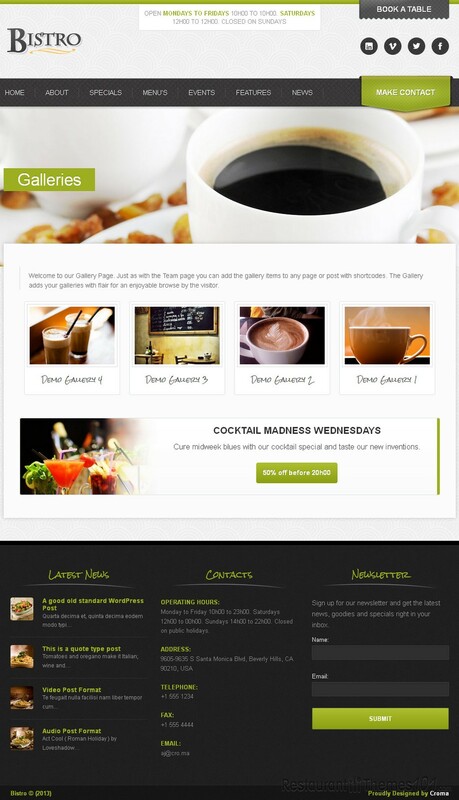 Bistro has a responsive layout design and it will work perfectly well with all devices. Everything in the theme will automatically adapt to any given screen size or resolution. It is also tested for cross browser compatibility, and it works perfectly well with all popular browsers, including IE8, IE9, IE10, Opera, Safari, Firefox and Chrome. The developers offer excellent support and they will be there for you if anything ever goes wrong or if you ever have any questions about the theme you need answered. All you need to do is install the theme, which will take only few minutes, and watch your business grow rapidly.